My father preferred to drink wine out of traditional Greek wine glasses: simple small glasses without a stem and about twice the size of a shot glass. Even when he had parties at home in South Africa he eventually had enough of these to go around so he did not have to put out stemmed and bowled glasses. He loved wine. He could justify drinking wine with many biblical quotes. Occasionally my mother would demand proof and he would page through the Bible, pointing and tapping the verse. “Here it is. Take some wine for thine stomach’s sake.” After which he would fall sound asleep. When his cousin Panayiotis was out from Greece I was tasked with taking him on holiday to Cape Town. We had a fantastic time. I learnt to lunch on watermelon, baguette and white wine. We arrived back with my red Honda Ballade loaded with cases of wine that we used to barricade my father’s bedroom door the next morning, after telling him we did get any wine when e arrived. My father laughed as he opened the door and saw ten cases of wine blocking the exit. Those were good times. My father’s passion for wine came from Greece. In the village, Kakouri, as he liked to call Artemision, he had wine made annually. The grapes were from a vineyard my grandmother owned. I was never there for the pressing, but some late summers I saw and smelt the residue of the pressing in the small plaster tub, like an old fashioned Jacuzzi, next to the steps that led down to the cellar. When we were younger we used to whitewash the steps and walls in the cellar to cover the wine stains, and I suppose to keep us busy. The pressing must have been done by foot, and the spout ran out above the steps, where a bucket would have been placed to collect it. 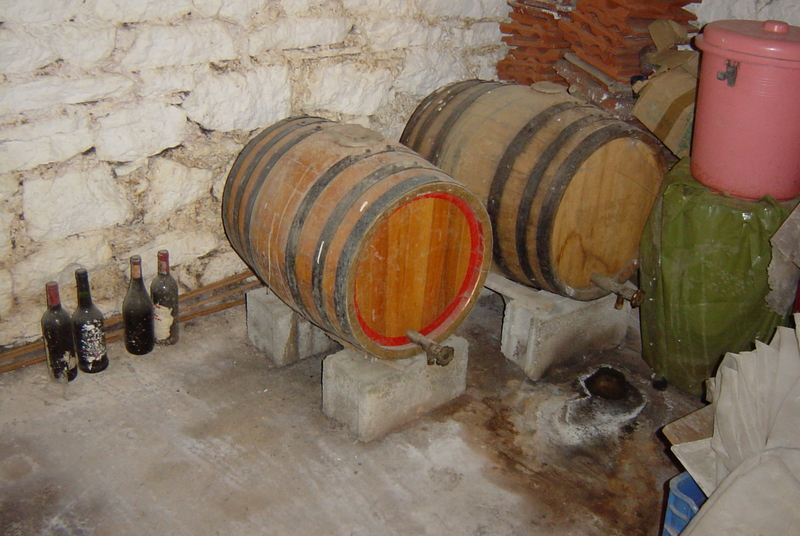 In the good times there were there big barrels in the cellar; this year’s wine, last year’s, and the last good year’s. The plugs on the top of the barrels where the wine was poured in were sealed with limestone. These wines were Retsina. They were organic and preserved not with sulphur, but with pine resin, as the Ancient Greeks would have done. The cellar was always cool, and in the hot dry village summer when temperatures would reach over 40 degrees, it made an aromatic light drink to accompany local lamb and cheeses with robust vegetables from the fields. Great story. I particularly liked the denouement at the end! Great story. I don’t know about Retsina tasting like donkey urine – but it sure kicks like one (and the headache after!!!). Trust me…he used to bring bottle back reverently;y but they did not travel well. Better drunk there with real food!